Do You Grind Or Clench Your Teeth? 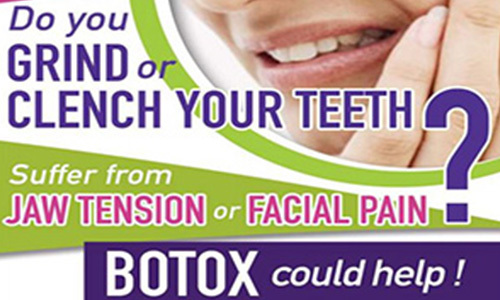 Or Do You Suffer From Jaw Tension & Facial Pain? We are based right here in Brisbane, and we can help! The ‘sore jaw’ ache that you may be experiencing from grinding your teeth or even clenching your teeth, is referred to as your Temporomandibular Joint (or TMJ for short), whilst the pain is better known as a ‘Temporomandibular Disorder’ (TMD). It is the hinge joint which connects your lower jaw to the temporal bone of your skull, which is front of the ears on the side of your head. These joints are flexible and by moving, allow all of us to be able to chew, talk and yawn. The jaw ache, or Temporomandibular Disorder, is often a misdiagnosed and misunderstood pain, often as a result of problems with the jaw itself and surrounding facial muscles. Whilst in many cases the exact cause of TMD is not yet clear, quite a few Dentists believe that symptoms come from issues with patients jaw joints and muscles within the jaw. Other symptoms include previous injuries, teeth grinding (Bruxism), clenching of the teeth, stress and sleeping orders to name but just a few. When looking into treatment for Teeth Grinding, Teeth Clenching and TMD, it is advised you book in an initial consultation with your AADFA approved Dentist, to discuss an individual plan. Please do not hesitate any further, if you are a looking to correct any part of jaw ache or need assistance with teeth grinding and clenching, make sure you book in for a consultation with Dr Audrey Hii today to discuss the best course of action and options available for you.